Today’s poster comes from Corey Duke. His Neuroscience poster got lots of love when he posted it on Twitter. (In flagrant violation of Neuroscience meeting rules, I expect.) Click to enlarge! In the work we present here, we put a great deal of thought into determining exactly what stories we wanted to highlight. When dealing with large data sets, there is a delicate balancing act in trying not to overwhelm or detract from the larger broader story lines, while still presenting the interesting findings that are more “in the weeds”. With audiences at meetings like Neuroscience being so broad in background and knowledge, our general goal with this poster was to strike that balance, to give brief captivating broad overview presentations, particularly to those less familiar with the field, while still presenting the more detailed findings that experts would perhaps find most interesting. Although it is overwhelming at first glance, I believe we were able to achieve that here, and in a way that we found alluring. 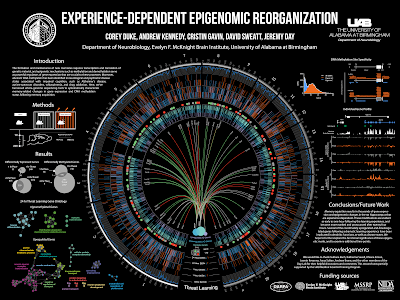 With all of that in mind, we chose to build the poster around the large circular plot we present in the middle (a circos plot), which shows the specific location of the genomic changes we were interested in across the genome. We wanted to blow it up to emphasize just how robust the changes we observed were, and to highlight some of the interesting analyses we performed in the middle of the circos plot. Because it was so large, we were able to add quite a bit of detail and make it intricate without fear of it being too small to read or pick out. It also became quite fun, as attendees could search for genes they knew out of the ones we highlight in the middle, and follow them down to the bubbles to learn about what they were doing. This was much more captivating than for instance presenting gene lists in a table, etc. Although I’m not always a fan, once we tried the plot on it we fell in love and had to go for the solid black background. In general, I avoid posters that are walls of text, and we tried to minimize it here. Because we didn’t have much of it here though, aspects of the poster would have been difficult to understand were I not there to present it. I really like our methods section diagram, as it was simple, straightforward, and easy to understand and refer back to as I presented, which really helped to keep the larger picture in mind as I went through our results. I also think all the circular data presentations go beautifully together. 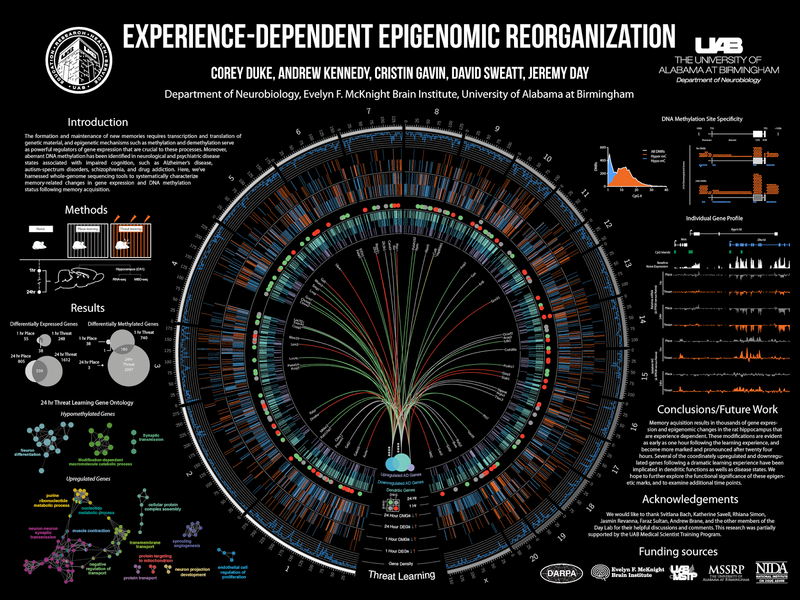 We had another earlier version of this poster where all of the data is represented through circular plots, and the way it all came together was stunning. In the end, we elected to swap that out for the plots on the right side though, as we thought that told a few more interesting arcs than the circles. We made the plots using several software programs and several of our own lines of code, but we put it all together in Adobe Illustrator. Overall, we’re very happy with how the poster turned, and everyone seemed to love it. I had 3 different run-throughs depending on the audience: 2 mins, 5-6 mins, and 10 mins. I think being able to cater the presentation so readily to the audience’s interest, background, and attention span was appreciated by all, and allowed for many people to be drawn in who were from different backgrounds. 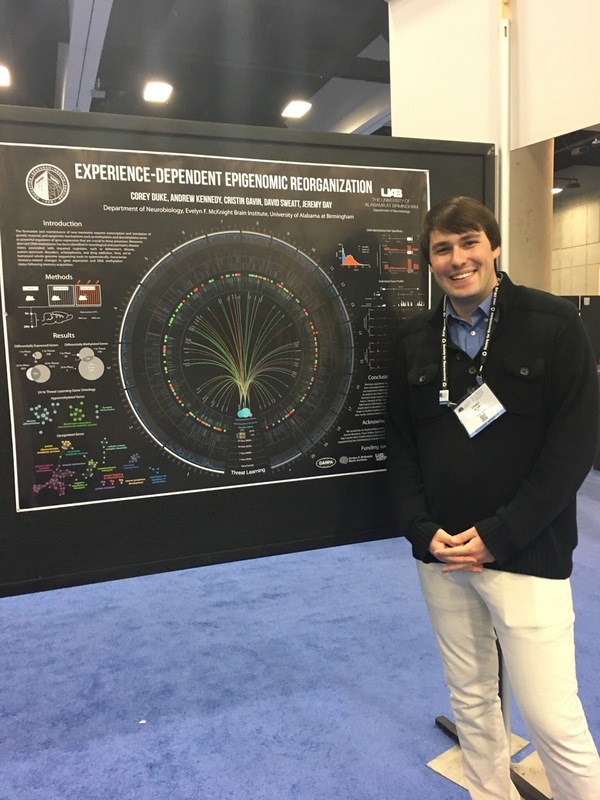 Because the poster was so aesthetically pleasing, we drew quite large crowds at Neuroscience. When you devote so much effort to the science, it’s unjust not to devote yourself to the presentation as well. Hat tip to Caitlin Vander Weele. I intentionally suggested focusing on the chasms you WANT to bridge -- as opposed to any and all that exist. In my experience, most museum workers have plenty of bridging to do across race, ethnicity, economic status, immigration status, generation, and educational attainment... let alone politics.